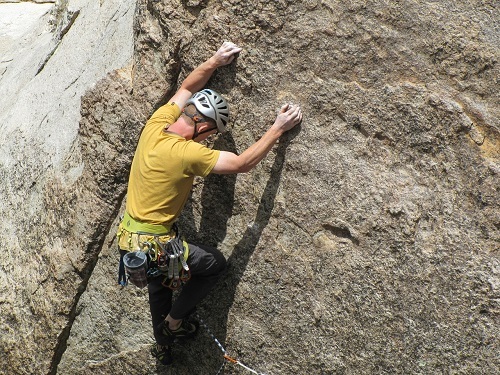 While many people enjoy indoor climbing as a hobby and have no plans to take it further, for others it’s just the start of training and getting their body ready for what they really want to do – venture outside and climb real rock faces. Indoor climbing walls are a great place to start as they give you a safe and easy environment in which you can learn to climb and practice your skills, but it’s no replacement for the outdoors with the changing scenery and weather all around you. This is the most common type of leader climb where the lead person will use already set bolts along a pre-determined route and will build an anchor at the top for the climbers to use. These are pre-planned climbing routes which will have been used many times before. Traditional climbing is also led by a lead climber but in this case the leader will use temporary protection items throughout the route to help protect climbers from falls. Once the last climber has ascended, the protection will be removed from the route. With traditional climbing there is no pre-determined route as the climbers are placing their own equipment as they go so this is more adventurous and equally is potentially more risky. This style of climbing sees the climber using devices which are attached to protection. He then climbs on the devices to make his way up. Generally, this approach would be used on very steep or very long climbs. Free climbing is when climbers make their way up using only the natural features of the rock, relying on rope and equipment only to prevent a fall. This is where the climber performs completely free of any equipment at all, relying on their own skills to make the ascent and without any protective equipment. When starting out as a beginner with outdoor rock climbing, you will need to develop your own set of gear and equipment, which you will understand more and more about as your skills and experience using it grows. These are the most important piece of gear you will ever buy; after all, they connect you to the rock you are climbing on. When starting out, choose climbing shoes which are for all round use and which are comfortable. These are designed to protect you should you fall – there are dynamic ropes which have elasticity to absorb your energy if you were to fall, and static ropes which are used to anchor and pull equipment up for example. This is how the ropes are connected to the climber and they come in a variety of styles. Go for comfort when you are choosing your first harness and one which has enough loops for your ropes and belay device. This is the mechanical friction element which you use to control your rope. It provides an easy way to stop rope if you were to fall and can be used to control descent on a rope when travelling down a climb. A carabiner is a metal loops which has spring-loaded openings and they are used as connectors between ropes. There are locking and non-locking versions and they are used to connect the rope to an anchor or to attach the climber to the middle of a rope. There are a number of different protection devices available but the aim is to provide a climber with the ability to create a temporary anchor point on any rock, during a climb, to help support their ascent and prevent a fall. While most indoor climbers don’t bother with helmets, when climbing outdoors it is advisable to wear a protective helmet in case of falling debris, or equipment, and to protect your head if you were to fall and crash against the rocks. If you are deciding to try rock climbing as a total beginner it is always advisable to do it under supervision until you have mastered all of the techniques and become familiar with the skills and equipment needed. Following a sport climb is a fun and good place to start out as a beginner and as you get more adventurous you can join a climbing group and venture out onto the more exciting traditional style climb routes to really test your skills. This entry was posted in Land Sports, Rock Climbing and tagged Rock Climbing. Bookmark the permalink.